Offer the same strength and protection as metal panels, but they are much lighter to handle and allow in natural light, so you can avoid that ‘cave feeling’ during the time you’ve installed them to protect your home and family. Our panels are easy to install, whether choosing from our direct mount or the track mounting systems. Each storm panel stacks easily on top of each other or neatly against the wall, requiring minimal storage space. 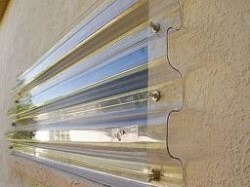 Our storm panels have been tested and have State of Florida approvals. We offer: 24 gauge galvanized steel storm panels, .050 Aluminum storm panels & Clear Lexan storm panels. Taping your windows is a waste of time because it gives very little strength to glass and has no protection towards debris. Storm Shutters are for you?